However, the 2017-2019 and the 2014-2016 allocations are not really comparable. The 2014-2016 allocation period was unique because it represented a transition between the old rounds-based system and the new allocation-based funding model. The 2014-2016 allocations contained both existing sources of funds mobilized during the rounds-based system that were undisbursed as of 31 December 2013 and additional (i.e. new) money from the Fourth Replenishment in 2013. The 2017-2019 allocations contained primarily new money from the Fifth Replenishment in 2016. In addition, the 2014-2016 allocations were intended, exceptionally, to cover four years instead of the usual three (more on this below). Of the $15.77 billion available for allocation to countries for the 2014-2016 allocation period, approximately a third ($5.55 billion) consisted of existing funds. Proceeds from 5th Replenishment (gross) $12.90 b. Minus: Adjustment related to currency exchange rates – $0.89 b. Minus: Reduction for technical assistance and other donor conditions – $1.12 b. Proceeds from 5th Replenishment, rounded (net) $10.90 b. Minus: Global Fund operating expenses – $0.90 b. Funds available from the 5th Replenishment for allocation $10.00 b. Funds available for allocation (gross) $11.10 b. Minus: Reserved for catalytic investments – $0.80 b. Total funds available for base allocations to countries (net) $10.30 b. Plus: Funds available for catalytic investments + $0.80 b. Total funds available for allocation $11.10 b. Note: In 2017-2019, no money was set aside for incentive funding as this mechanism was not part of the refined methodology for this period. However, as shown in the table, $0.8 billion was approved for catalytic investments. So, while total funds available for the base allocations to countries was $4.52 billion less in 2017-2019 than it was in 2014-2016 – $10.30 billion vs. $14.82 billion – much of the difference can be explained by the $5.55 billion in existing funds included in the allocations for 2014-2016. Also, in the 2014-2016 allocation period, some countries received funds for unfunded quality demand (UQD). However, it is too early in the 2017-2019 allocation period for UQD to have been funded. 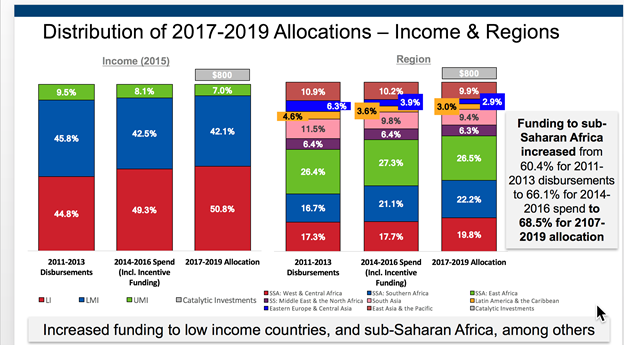 In addition, in the 2014-2016 allocation period many countries received additional funding beyond their base allocation in the form of incentive funding. Many countries will receive additional funding beyond their base allocation in 2017-2019 in the form of catalytic investment funding (especially matching funds), but not all of this funding has been awarded yet. One of the reasons why it is misleading to make a direct comparison between the two allocation periods is that the 2017-2019 allocations are intended to cover three years of programming (as is typically the case for an allocation period), whereas the 2014-2016 allocations were exceptionally intended to cover four years, owing to the transition from the rounds-based system to the allocation-based funding model. That the 2014-2016 allocations covered four years appears to be not widely known, although it is part of committee and Board materials and decisions, and is mentioned in other communications documents. Country X is informed of its allocation in March 2014. The allocation consists of a mix of existing and additional funding. Country X submits a concept note for TB in May 2014 in which it proposes a grant start date of 1 January 2015 and a grant end date of 31 December 2017 (i.e. a three-year grant). While the concept note is reviewed, and while grant-making takes place, Country X continues to provide services using funds from the existing portion of its allocation. The grant is approved for funding, and implementation starts on schedule, i.e. on 1 January 2015. Thus, Country X’s TB allocation covered four years of funding – the three years of the new grant (1 January 2015 to 31 December 2017) plus one year of the existing grant (1 January 2014 to 31 December 2014). Country Y is informed of its allocation in March 2014. The allocation consists of a mix of existing and additional funding. Country Y submits a concept note for HIV in August 2014 in which it proposes a grant start date of 1 July 2015 and a grant end date of 31 December 2017 (i.e. a two-and-a-half-year grant). While the concept note is reviewed, and while grant-making takes place, Country Y continues to provide services using funds from the existing portion of its allocation. The grant is approved for funding, and implementation starts on schedule, i.e. on 1 July 2015. Thus, Country Y’s HIV allocation covered four years of funding – the two-and-a-half years of the new grant (1 July 2015 to 31 December 2017) plus one-and-a-half years of the existing grant (1 January 2014 to 30 June 2015). Since it is illogical to compare the allocations for the two periods, the Secretariat believes that it makes more sense to compare the 2017-2019 allocations with (a) the three-year equivalent of actual and forecasted use of funds from the 2014-2016 allocation period (for the components eligible to receive funding in 2017-2019) – i.e. the amount of funding awarded for 2014-2016 that the country was able to invest; or (b) disbursements for 2011-2013, the three-year period prior to the introduction of the allocation-based funding model. The Secretariat has provided Aidspan with the figures shown in Table 3 below. This comparison shows that the 2017-2019 allocations were a little below the 2014-2016 actual and forecasted use of funds, but were almost $1 billion higher that 2011-2013 disbursements. The actual and forecasted use of funds are calculated by looking at the disbursements that have occurred and the forecasted disbursements arising from the total funds available to each country disease program during the 2014-2016 allocation period (allocation, incentive funding, shortened grant duration funding, extension of early applicants’ funding, UQD, etc.). From this, three-year equivalent amounts are taken to ensure comparability between the 2014-2016 allocation period, for which funds were to be invested typically over four years, and the 2017-2019 allocation period, for which three-year funding envelopes were provided. The Secretariat provided Aidspan with a chart showing the comparisons based on income level and regions, using the three categories described in Table 3 (see Figure 1). This same information is available in the Global Fund’s Overview of the 2017-2019 Allocations publication. A detailed explanation of the methodology used to determine the 2017-2019 allocations is available here. Additional information on the 2017-2019 allocations is available here. Aidspan is grateful to the Secretariat for reviewing a draft of this article and providing additional information.